Royal Challengers Bangalore (RCB) skipper Virat Kohli is currently going through the worst phase of his IPL career as RCB captain. Bangalore team has lost seven matches in IPL 2019 and emerged victorious only once against Kings XI Punjab (KXIP). RCB lost their last game against Mumbai Indians (MI) on Monday, April 15, 2019. 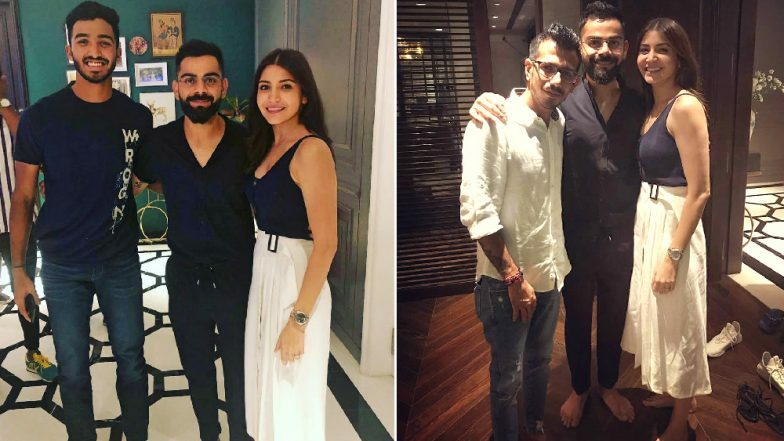 RCB star spinner Yuzvendra Chahal and other Bangalore players posted pictures with Virat Kohli and Anushka Sharma from the dinner party held by Kohli at their Worli residence in Mumbai just a day after MI vs RCB match IPL 2019. Anushka Sharma and Virat Kohli aka Virushka’s Latest Pictures Leave Fans Berserk! RCB players seem to find some relieve time at the dinner party hosted Virat Kohli and his wife Anushka Sharma at their Worli Sea face Mumbai residence. RCB team might not be doing well, but their bowler Yuzvendra Chahal is in the race for the purple cap as he has bagged 13 wickets so far in IPL 2019, just four wickets behind from Delhi Capitals bowler Kagiso Rabada. Funny RCB Memes Go Viral As Virat Kohli Led Royal Challengers Bangalore Lose to Mumbai Indians by 5 Wickets at Wankhede in IPL 2019 Match. Royal Challengers Bangalore (RCB) will play their next match with Kolkata Knight Riders (KKR) on April 19, 2019, at Eden Garden, Kolkata. RCB will have to win all their remaining six matches to create an outside chance to make it to the playoff.